The condition amblyopia, more commonly known as lazy eye, causes vision problems in around 2 percent of all infants. Lazy eye occurs when one eye struggles to see properly. Over time, an infant will favor the other eye, further weakening the problem eye. The first signs of lazy eyes in infants vary depending on the child. But, a few key symptoms mark the onset of this condition. Infants with a lazy eye often have one eye that wanders inward or at a different angle. Similarly, the eyes sometimes become crossed for prolonged periods. Because an infant won't tell you that her vision is fuzzy, you must keep a close watch on how her eyes move and behave. A lazy eye may also make one eyelid droop, or cause an infant to close one eye more often than the other. As she gets a little older, she may use her hand to cover the lazy eye to help focus. A baby that can't focus properly often squints with one or both eyes. The authors of "Children's Health for Dummies" suggest looking for early signs of squinting from 4 months of age. Hold a colorful toy about 8 inches from your baby's face. Slowly move the toy left and right. Your baby's eyes should follow the toy. An eye that stays in place while the other moves, or eyes that go crossed or at strange angles might suggest a lazy eye. In the first 4 months after birth a baby's vision is still blurry and developing fast. As your child adjusts to the new environment, her eyes might occasionally cross or flicker. This is a normal part of infant development. If the eyes stay crossed or looking in different directions for several hours at a time or longer, speak to your doctor. 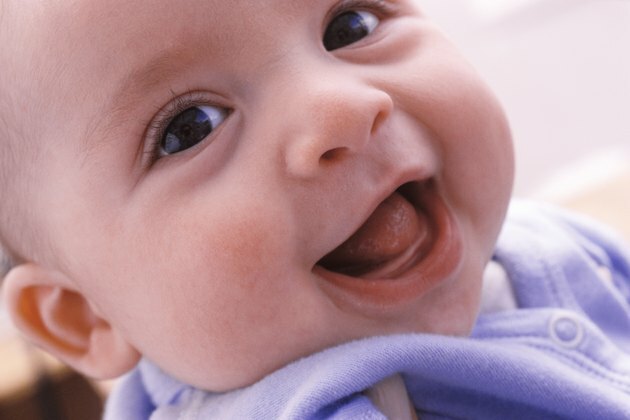 In some cases, this may suggest the conditions strabismus, a misalignment of the eyes in infants, rather than lazy eye. Early signs of lazy eye in infants usually don't include inflammation, pus or itchy fluid. Any of these symptoms may suggest another eye condition, such as a blocked tear duct, conjunctivitis or even cataracts. The only way to know for sure if your infant has a lazy eye is to take him to a doctor or ophthalmologist. These medical professionals use light-emitting equipment or specialist eye drops to help look for any problems with the lens, pupil or eye in general. UIC Department of Opthalmology and Visual Sciences; Your Baby's Eyes; Lawrence M. Kaufman, M.D., Ph.D.